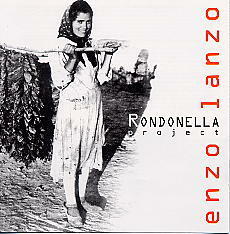 Led by the drummer, Vincenzo Lanzo, Rondonella Project involves nine musicians, some of which are well known on the international scene: Pino Minafra and Antonello Salis to name but a few. Vincenzo Lanzo tries to revive forgotten folk songs of his beloved Italy and present them in a new way. The music is full of Mediterranean flavour: it breathes with passion and sadness, yet is played with total abandon. Notes by Enzo Lanzo. Poetry by Vittorino Curci.